When I posted the butternut squash soup with cinnamon sugar crouton recipe I wanted to try after a friend of ours made herself a pot back on Captiva Island, I mentioned in one of the photo captions that our cutting board was on the verge of giving up the ghost after years of faithful service. 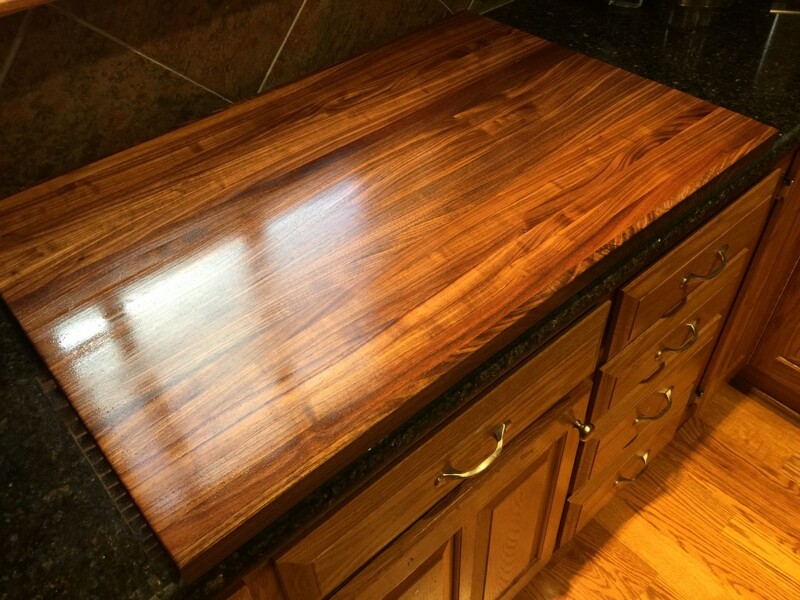 Aaron and I had been looking for the perfect replacement for about twelve months but had run into difficultly getting what we wanted – a high quality, edge-grain, 36″ x 24″ darker-stained board that was at least 1.25″ to 2.0″ thick. A custom cutting board of that size would allow both of us to be productive as we divided the work for bigger family dinners; would make it easier for me to sort out the large quantities of granny smith apples I need for my homemade pies, pre-sort out ingredients so we can just go down the list and use them as necessary on the nearby stove. The utility gain would be tremendous. [mainbodyad]At the suggestion of James Kraus (thank you, thank you, thank you!) who was not only kind enough to provide us with a recommendation based upon his own search for a custom cutting board, but later posted pictures of the finished product he had received, we contacted Dan out in San Diego, who runs a business called Custom Cutting Boards. He lets you specify your design parameters, wood type, and even small details like whether you want rubber feet on the underside. Half-a-dozen emails and barely a week later, it was done. The cutting board arrived this morning and we’ve been seasoning it with mineral oil. By tomorrow, we should have both sides fully treated so it will be ready to enter service. We ended up going with a walnut cutting board, 1.25 inches thick, 36 inches by 24 inches. We seriously considered 2.00 inches thick but at this size, I’m so glad we didn’t do it because it would have been difficult, if not impossible, for most people to lift without the risk of dropping it. The speed with which it was done was awesome and the price wasn’t bad, either. Delivered, it came to $412, of which $360 was the custom cutting board itself and $52 was shipping. 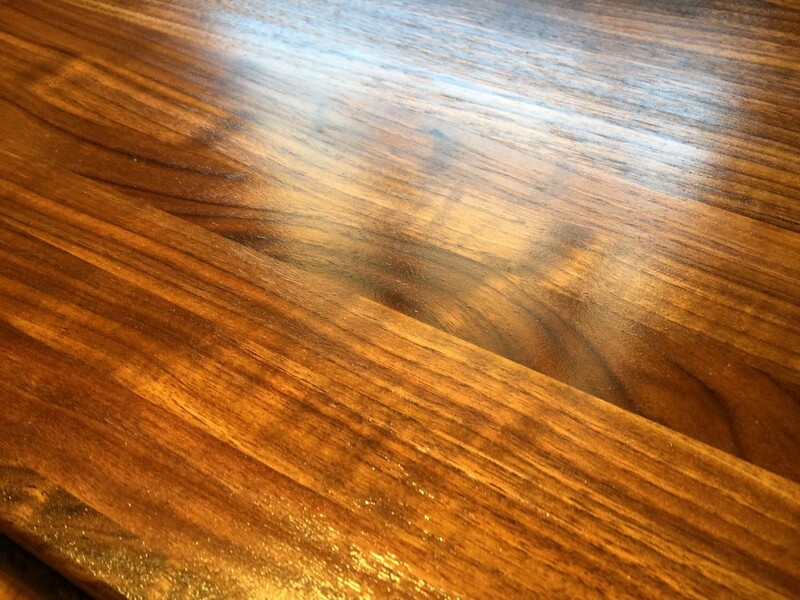 Here’s a closeup of the mineral oil soaking into the custom cutting board. If we’re going to treat this thing once a week like the materials included in the package recommend, I need to find a decent bulk supplier of the food-safe kind. You’ve seen us use that cutting board to make everything from desserts such as the caramel pecan apple pie and nectarine white chocolate cream pie to Italian food like stuffed ravioli in a tomato and cream sauce and spinach fettuccine with butter and Parmesan cheese; tomato sauce with onion and butter; Japanese Gyoza with spicy sauce; banana walnut birthday cake with cream cheese icing; beef bulgogi; Saag Paneer with homemade Indian cheese; nights we stayed up testing dessert recipes; improving canned beef stock; winter dinner at home playing Dragon Age: Inquisition. You saw us use it in our spicy white chicken chili recipe and our Wendy’s replica red chili recipe. Even when it wasn’t in the picture, it was used for Korean spicy pork stir fry, our first Bibimbap, the most delicious corn chowder recipe you’ll ever find.